I was clicking through a Lexus ad for their new IS "Wield Precision" campaign when I noticed on the landing page at Lexus.com that I could "Like" the page. The hero image area of the page showcasing the car driving down a road had 167 'Likes' already. 'Like' of course is Facebook nomenclature for 'engaging' in an activity demonstrating one enjoys a piece of content. What started as a way to like someone's Facebook status update or like a photo posted has turned into 'Like' anything fever. I just wonder what's the real point? Have we lost our minds as marketers thinking if someone clicks a 'Like' button that there is somehow more value to that view than just a page visit? Or have we as consumers lost our minds thinking someone cares we visited a web page and now we must show our satisfaction? Even if someone does 'Like' the Lexus IS page it barely registers it on Facebook where the brand gets a small one line message that I did something. What I liked isn't even very clear (see image at right.) To clarify, I'm not picking on Lexus. I'm just using this latest example from the Lexus IS marketing team. In the end, it really doesn't matter because Lexus did get a few more people to share an experience with only the cost of having a developer add a Facebook Like button. It's simply an concrete example of the whole problem with "Social Media". The "SM Industry", such as it is, is entirely focused on the fascination with getting "attention". "Likes", Twitter followers, Facebook friends, Viral videos, Internet Memes, Foursquare gatherings, all measure their "success" by the mere bodycount they generate. That's like throwing a party with free liquor, and proclaiming how many friends you have. Popularity is one and ONLY one aspect of Advertising and Marketing, and ultimately you need a MEASURABLE RETURN ON INVESTMENT - I.E. SALES NUMBERS. I continue to this day to ask SM "experts" for their R.O.I. results, and and out of hundreds of inquires, I've received TWO valid responses, and they were weak at best. If and when some marketing experts use SM, we will see valid results. Until then, most of it is snake oil, and a waste of time and money. Agree 100% - and I think Marketers are going too far by making people like content or the brand to view specific content. On top of that, these artificial 'likes' are being broadcast to one's network. But when someone 'dislikes' the brand after viewing said restricted content (without liking it first), that's not then broadcast to your network. Greta post! I like to have proper perspective. Perspective gets clouded when there is a financial interest in an outcome. I compared a Mashable and a Tech Crunch story both on a Nielsen-Facebook Study. The Study cherry picked 20 campaigns that worked. But decided to omit the 100 that didn't work. Then declared Facebook Marketing a success. Tech Crunch wrote a nice objective piece discussing this study. Mashable basically rubber stamped the Study declaring proof of success. I bring this up because if the Social bubble burst tomorrow Mashable's business is threatened with survival. But Tech Crunch covers so much more they could just eliminate Social from their offering. Lots of 'Social Agencies, Gurus, and Journalist's livelihoods' are all in on this stuff. If Lexus has 325,000 likes translating to 75,000 leads, and then 20,000 sales I would think differently. But we are not there yet. Chris, I am on the same page with you that the value of a "Like" is diluted at best but one little known fact that many people don't realize is packaged into Facebook Open Graph ("Like" buttons on external websites). 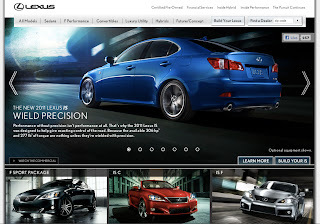 When you clicked "Like" on the Lexus IS image on Lexus.com, they now have the ability to post updates in your Facebook news-feed so technically it is worth more than a simple page view because they now have a method to reach you with new content down the road inside your newsfeed. its really a great post,we can understand the things going.